Calculate base and variable comp for reps and execs. 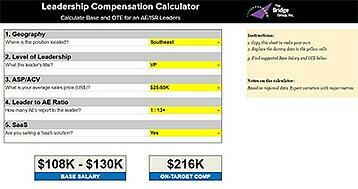 Based on our most recent AE metrics research, this calculator is drawn from a sample of 336 B2B technology companies. Get personalized base and on-target earning recommendations for your AEs and your sales leaders.